Hi friends! Today, I have a super fun post for you! It's my day to be on the May Arts Ribbon Valentine's Blog Hop! YAY! Two of my favorite things, ribbon and Valentine's! To start the hop, head over to the May Arts Blog. Be sure to leave a comment on every blog because May Arts is giving away 4 spools of ribbon as a prize! Here's a picture of my Valentine's Day mantel with a couple of the projects I made. As you could probably tell from my blog title, I love hearts! That's one of the reasons I LOVE Valentine's Day so much. I made the heart garland and the little jar for this hop. Here's a close up of the ribbon garland that I took while I was making it. I just cut a length of ribbon and stapled the cut ends together. Then I placed a staple directly across from my first staple making the bottom of the heart. I linked my hearts together as I went along. When I was done making my garland, I used fabric stiffener all over my hearts to make sure they all keep their shape. I used 3/8" Stripe/Stitch Grosgrain Ribbon for this garland. After I decorated my mantel, I thought it needed a little something extra so I put together this SUPER simple jar. I had an empty jar and I filled it with conversation heart candies. Then I used 1/2" Pink Crotchet Ribbon as a finishing touch. This is really simple and a perfect little gift. Lastly, I made this wall decor. I saw a project online that used a child's footprints slightly overlapped to make a heart and thought it was so cute. I made this wall hanging using my kids footprints that I put onto cardstock with non-toxic finger paint. This part was SO hard. Apparently, kids don't like to have their feet painted then stamped onto paper. Go figure. Then I cut out the hearts and stapled them onto the fuchsia ribbon. I made a loop at the top so you can hang it. Then I tied on a light pink bow. I used the two pink 5/8" Satin Scalloped Ribbon for this project. Have a great day, friends! And don't forget to leave comments for your chance to win! Love your heart garland but those precious little feet are just a heart stealer. Very cute ideas for Valentine's day. 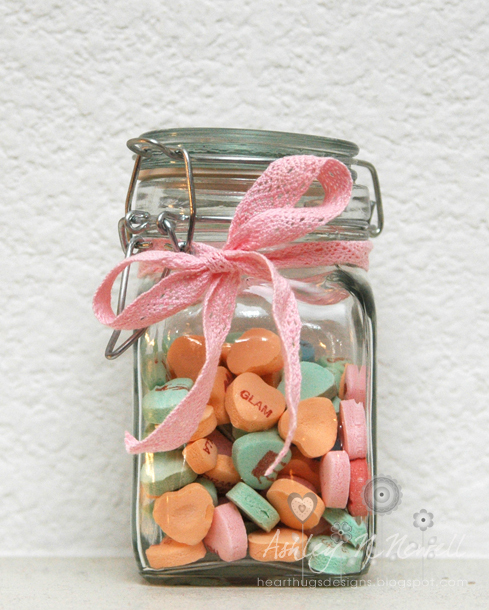 I like the pretty garland and the conversation hearts in a jar and the feet are so precious. Cute projects!Love the feet hearts! What wonderful ideas you have there. But those little feet made into hearts is super great. I can just imagine how anyone would love seeing their little one's feet done into a wall hanging that way. As a grandma, I know I would. Love that ribbon heart garland...great idea! And I am totally stealng that feet heart idea! :) Hope you are starting to get a little more rest...I know it is hard with 3. The home decor ideas for Valentines Day are great, especially the heart garland. 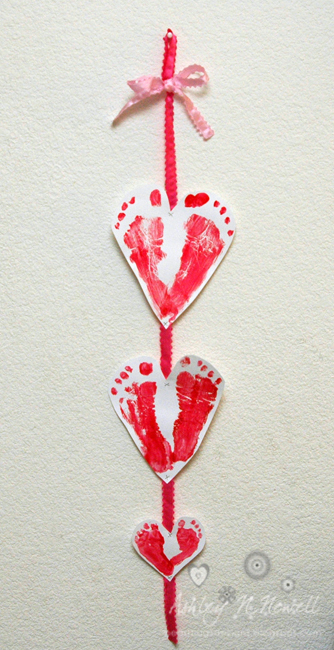 I also think the wall hanging made with the little one's feet in the shape of a heart is so very, very cute! Great projects Ashley! Don't know how you're doing it with a newborn! I love the garland, but my favorite projects are the feet hearts, so cute! OMG, super cute ideas! Love the heart ribbon garland and the footrprints! So creative! Love the baby-feet hearts. What a keepsake. Your mantle looks great. Oh, the baby feet hearts are just adorable! I love all your sweet ribbon ideas! So simple and cute! Nice job. LOL....great story! I always thought kids LOVED getting messy with paint, but I guess that's only when you aren't around and they are painting your living room furniture or fireplace by themselves!!!! So cute, and love your heart border banner! The footprints are a real winner and the scalloped ribbon is just perfect! What fabulous home decor projects (I'm the worst decorator). Love those cute little footprints!! The foot prints are just too cute! Love all the projects. I think I may try the ribbon swag across the fire place. Lovely idea. Three crafts - and I love them all. As a preschool teacher, I just need to add that it is much easier to get the paint off their feet if you apply lotion first, then the paint! 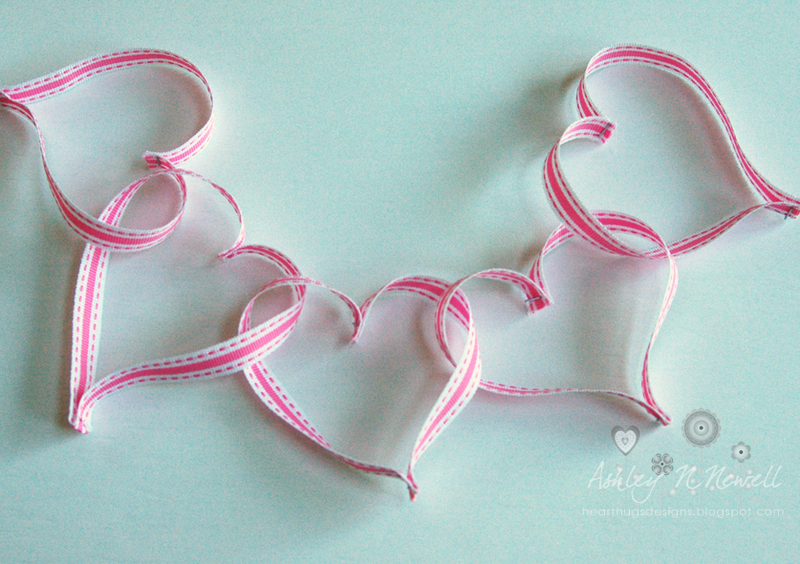 Now your ribbon heart garland is so elegant - love how the ribbon just moves into the heart shape sooooo smoothly! I like your projects. The garland is very festive and nice and dainty. The footprint hearts are a great idea. Glad you made it though the footprint part. I love the garland-that I know I could do! As much as I absolutley love the footprint decoration , I think my 5 &8 year old boys would think I was completely crazy if I suggested that and knowing them if they did go for it -it would be a complete mess! LOL! Sweet, sweet projects...but the footprint heart hanging is really precious. I know you'll be glad you have that years to come! Very clever, girl. Just so innovative. The hanging with the feet imprint really brought a smile to my face. Wonderful ideas for home decor and the jar of hearts, but LOVE the wall hanging of the cute feet!! Adorable! Ribbon hearts!!!? SOOOOO cute! Love your treat jar as well! Super cute projects! Love them! I just adore that pink crochet ribbon! love all the projects Ashley! Wonderful projects, Ashley! I love the heart ribbon banner and the kids' feet are so cool as hearts!